South Adelaide Panthers FC is at an exciting time in our development as a club. Tom Monsigneur has been appointed Technical Director with an emphasis on the FFA framework giving valuable insight and support to our coaches. All of our coaches are either already fully accredited or in the process of acquiring their credentials. Our dedicated coaches have conducted Elite Academies and School Holiday Soccer Clinics, all with a view to reaching improved player skill levels and cohesion. Our players have been extremely successful with many selected for various squads, including the STIC teams, the State Secondary Schoolboys team and the SAPSASA State Team. We have strong, dedicated men and women on our committee who continue to work hard during this season to ensure our facilities, volunteers and procedures are the best in the south. 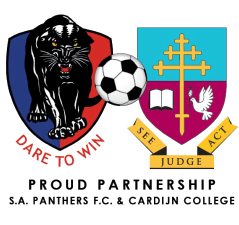 In 2018 Panthers will field small sided teams from U6-U11, junior teams from U12-U17, Pink Panther Under 11’s as well as Senior Men’s and Senior Women’s teams. 2018 is looking very bright at Panther Park!